Duct hose is offered in a range of styles designed for low pressure or low vacuum conveyance of air, dust and other nonabrasive materials. 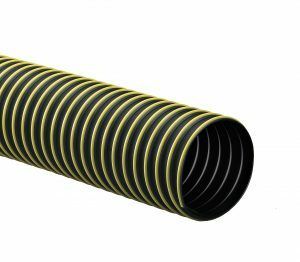 General purpose duct hose is typically thermoplastic with a spring wire or neoprene coated polyester with a spring wire. Thermoplastic ducting has higher moisture and chemical resistance and is a more economical option. Neoprene coated polyester ducting has superior tear and puncture resistance, and some versions hold UL 94V-0 flame retardant approval. Combine the best characteristics of both styles with our thermoplastic dipped polyester duct hose.